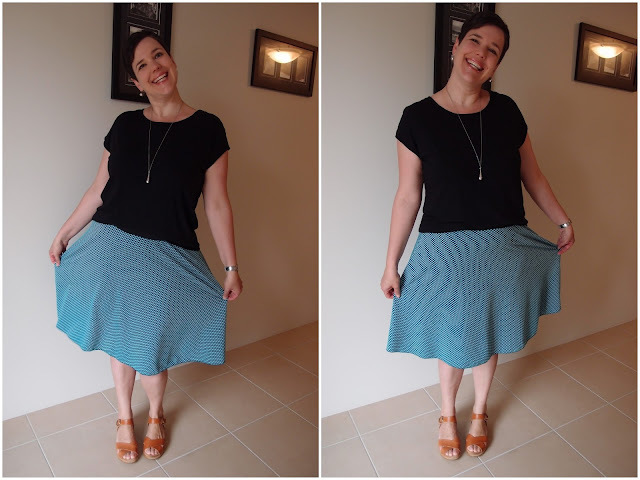 This skirt was actually meant to be a Lady Skater Dress but a fail with the neckband (me be sloppy in my sewing and not really caring about the dress as the material was looking a bit "too much for a dress") has resulted in a Lady Skater Skirt. I cannot say that I'm unhappy. 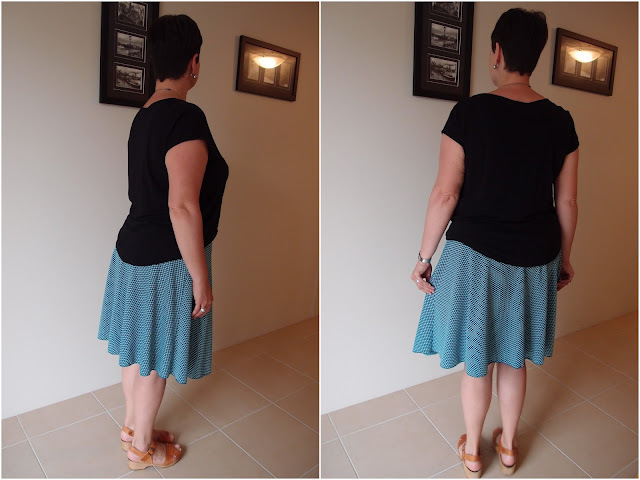 This is a pretty simple make....the skirt portion of the pattern, a 5cm elastic waistband and an overlocker rolled-hem. I don't think there's an easier skirt I could've made. That said I did spend quite a bit of time adjusting the settings on the overlocker to get the rolled hem looking as good as I could -- it's still not 100%, with a bit of pulling/gathering down there that I hope will work itself out ASAP. I'm paranoid about elastic waistbands being too loose...or too tight so I faffed with this for a while too. Because I had shortened the bodice of the Lady Skater Dress previously I had already added 2.5cm to the skirt to compensate for the loss of length. 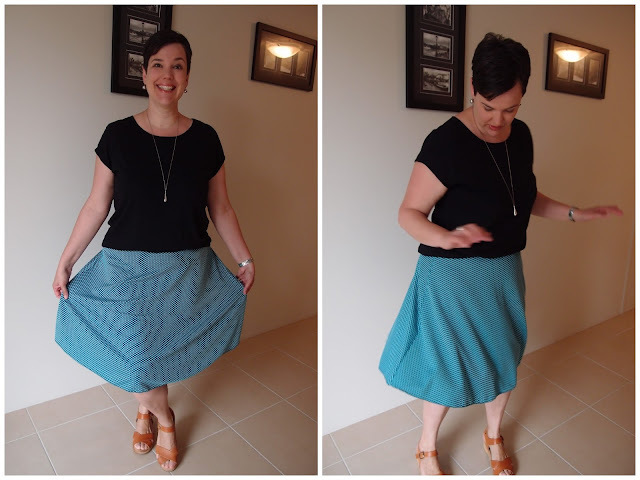 I will be making this skirt again and I'm going to add more length - perhaps 5cm. As you can see from the side shot my well-sized bum is making the skirt ride up at the back...more than I find acceptable. 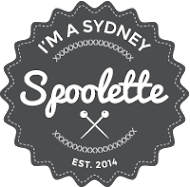 There's not much more to say about this make other than I'm pretty chuffed. 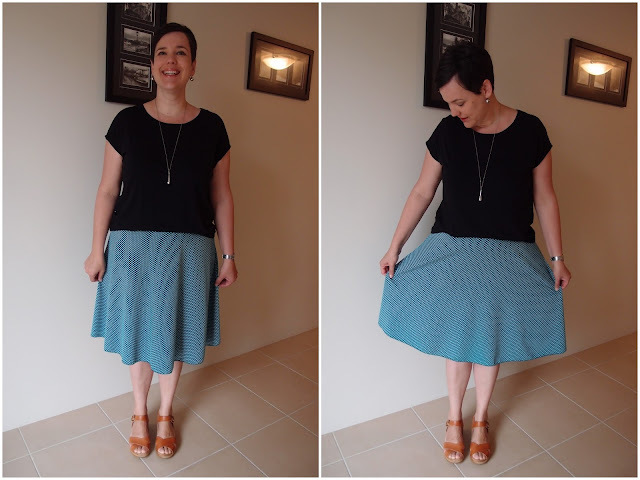 I really like circle skirts and I've wanted to make one ever since I started sewing but my waist is pretty big so patterns didn't tend to fit me. 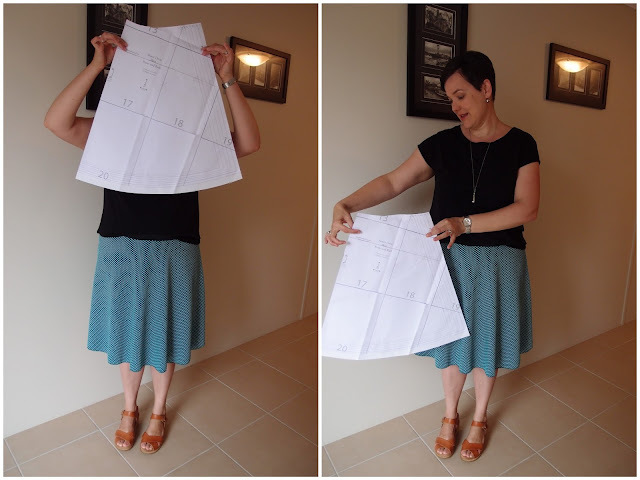 I'm so terrible at maths I my brain melted when I had to figure out the numbers to make my own pattern, and yes, even the By Hand London circle skirt app failed me (waist too big Miss Jane)! Changes for next time: Will add some more length to the skirt, maybe 5cm?